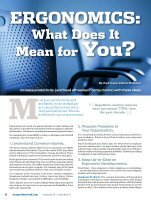 Home > Membership > Nonprofit World > Ergonomics: What Does It Mean for You? Ergonomics: What Does It Mean for You? Increase productivity (and head off workers' comp claims) with these steps.